Asus ZenFone Max Pro M1’s long-awaited 6GB RAM, 64GB inbuilt storage variant finally has a launch date – or rather, a launch month – July. The company made the announcement at the launch of the Asus ZenFone 5Z on Wednesday. To recall, the Asus ZenFone Max Pro M1 (Review) was launched in India back in April, and went on sale the next month. At the time, only two variants were made available – 3GB RAM/ 32GB storage, and 4GB RAM/ 64GB storage. The 6GB RAM/ 64GB storage variant was announced, bu the company had only said it would be coming “soon” to India. It also features a different camera setup, with a 16-megapixel + 5-megapixel dual rear camera setup, and a 16-megapixel front camera. The Asus ZenFone Max Pro M1 price in India, as before, starts at Rs. 10,999 for the 3GB RAM/ 32GB storage variant, going up to Rs. 12,999 for the 4GB RAM/ 64GB storage variant, while the top 6GB RAM/ 64GB storage model that will become available this month is priced at Rs. 14,999. At this price, the smartphone competes well against the Redmi Note 5 Pro from Xiaomi. To recall, the Redmi Note 5 Pro’s 6GB RAM/ 64GB storage variant is priced at Rs. 16,999. The Asus ZenFone Max Pro M1 is available exclusively via Flipkart in India. 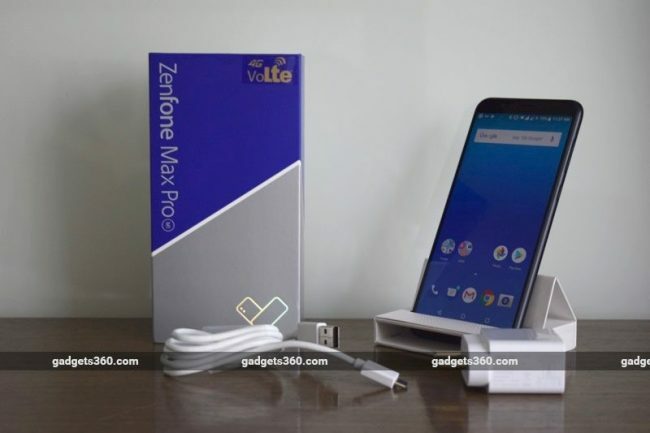 ALSO SEERedmi Note 5 Pro vs ZenFone Max Pro M1: Which One Should You Buy? The dual-SIM (Nano) Asus ZenFone Max Pro M1 runs a pure version of Android 8.1 Oreo out-of-the-box, and will get Android P and Android Q upgrades. It sports a 5.99-inch full-HD+ (1080×2160 pixels) IPS Full View display with an 18:9 aspect ratio. The handset is powered by an octa-core Qualcomm Snapdragon 636 SoC, coupled with an Adreno 509 GPU. As for camera specifications, the ZenFone Max Pro M1 bears a dual camera setup at the back with a 16-megapixel primary sensor and a 5-megapixel secondary depth sensing sensor. On the front there is an 16-megapixel selfie camera. Both the rear and front camera get soft-light LED flash. There is up to 64GB inbuilt storage on the phone, with microSD card support up to 2TB for expansion. And, a 5000mAh battery, with a bundled 10W charger, powers in the internals from under the hood. Connectivity options include 4G LTE, Wi-Fi 802.11 a/b/g/n with Wi-Fi Direct, Bluetooth 4.2 (with aptX), GPS/ A-GPS, BDS, GLONASS, Micro-USB, and a 3.5mm headphone jack. Sensors onboard the Asus ZenFone Max Pro M1 include Face Unlock sensor, fingerprint sensor, and the likes. Dimensions are 159x76x8.61mm and weight is 180 grams. We discussed whether Asus Zenfone Max Pro M1 is a Xiaomi Redmi Note 5 Pro killer on Orbital, our weekly technology podcast, which you can subscribe to via Apple Podcasts or RSS, download the episode, or just hit the play button below.